Did you guys know that there’s a National Oyster Day? Me either, until about a week ago. It got me thinking…I often order oysters, both raw and cooked, but I never prepare them myself. In honor of the holiday, I decided to try my hand at it. Growing up in the South made me particularly fond of fried seafood and after recently having amazing fried oysters at The Walrus & The Carpenter in Seattle, that definitely seemed like the way to go. The Nashville Hot Shrimp Po’ Boy I made a while back was so flippin’ good that I thought the oysters would really shine with that kind of heat. I am pleased to report that I was not wrong. I’ve already ended up making this recipe 4-5 times and have never had a problem gobbling them up! As this was my first time preparing fresh oysters, it was also my first time shucking them. I was a little intimidated, but by the third one, I felt like I had the hang of it. If you’re also new to shucking oysters, I highly recommend the Serious Eats guide. Using that and the OXO Oyster knife made the process really easy for me. I made these fried oysters spicy, but milder than Nashville Hot usually is. Feel free to add more cayenne if you would like them hotter. This time, I served these Nashville Hot Fried Oysters with tartar sauce as an appetizer. Next time, I think I might turn it into a Po’ Boy. Maybe even a mini Po’ Boy on Hawaiian rolls. Mmmm….. In a medium bowl, whisk together the whole milk, egg, and hot sauce. In another medium bowl, mix the flour and salt together. In either a deep fryer (I use this one) or a cast iron skillet, heat your oil to 350 degrees Fahrenheit. Take each oyster and dredge it in the flour, then dip in the egg/,milk mixture and then again in the flour. Be sure to shake off the excess after each step. 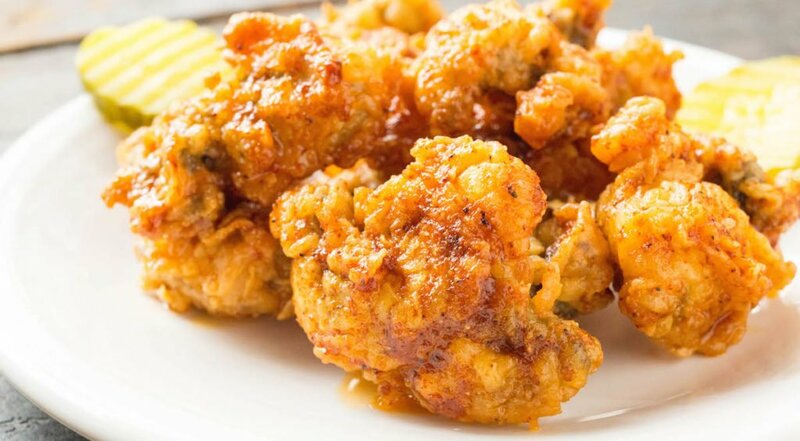 Fry oysters in batches (the big basket in my fryer can do about a dozen at a time), about 2-3 minutes on each side, until golden brown. After frying, place oysters on a cooling rack on top of a baking sheet. To make the Nashville Hot glaze, add the remaining spices to the melted butter and whisk together. Brush on each side of the fried oyster. I love oysters and this looks like a wonderful recipe! Can’t wait to try it! I would like to personally congratulate you as your blog Cooking With Janica has been selected by our panelist as one of the Top 100 Seafood Blogs on the web. I personally give you a high-five and want to thank you for your contribution to this world. This is the most comprehensive list of Top 100 Seafood Blogs on the internet and I’m honored to have you as part of this! I love oysters but I have never cooked them myself. I usually eat them out when we go for dinner. 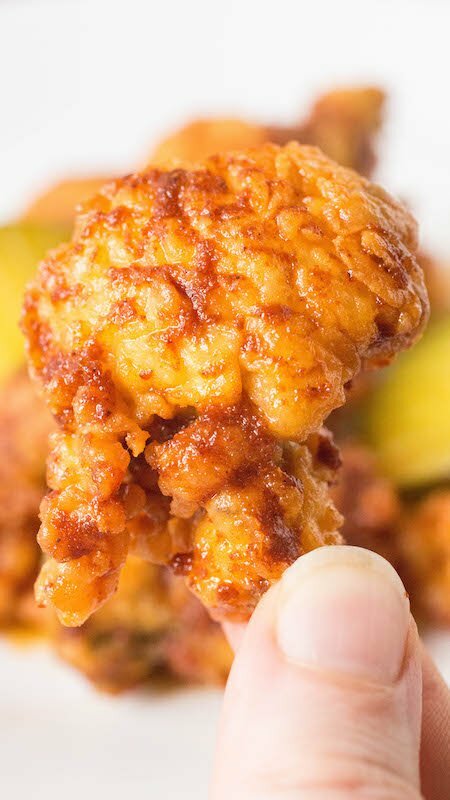 This looks so good and crispy too! I’m so tempted to try this at home. OMG! This looks moist and delicious! Oh wow – come to mama! These fried oysters look amazing! Thanks for the guide to shucking oysters, I’m a novice and will take all the help I can get. Very interesting. Thank you for your recommendations on the guide and knife to use – I am going to conider those. And the result is amazing – so mouthwatering! I ma HUGE seafood fan and my family too,I keep on looking for new exciting recipes and this is truly yum! We are HUGE oyster lovers and we make fried oysters often as well as eating them raw and in other dishes. We haven’t made them the Nashville way but we’ll give it a try. It looks good and we love spicy. My husband is a big fan of oysters and he will definitely appreciate this recipe!) Saving it for later! My husband LOVES Nashville hot chicken. I bet he would devour these delicious oysters! What a great idea!